If you've ever driven the speed limit on the Capital Beltway or Interstate 270, you've likely watched a stream of cars speed past. A Maryland state senator said it makes more sense for the law to catch up to the crowd rather than penalize drivers. Maryland state Sen. Joanne Benson, of Prince George's County, introduced a bill on Thursday that would raise the speed limit on I-495 from 55 mph to 70 mph. The bill would also increase the speed limit to 70 on I-270 and highways and interstates across the state. "People will beep their horns, they flash their lights, they yell out the window, because they are saying you are slowing down the traffic," Benson said. 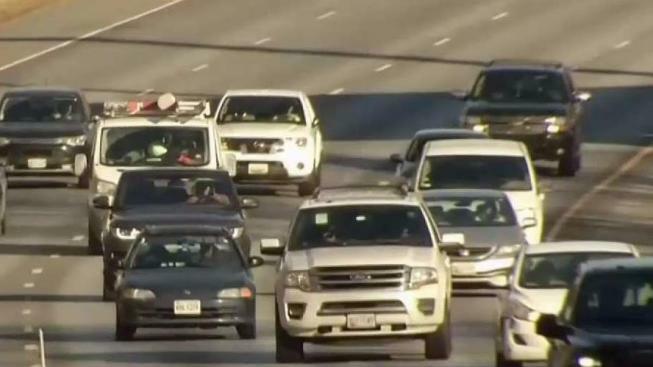 "When drivers use the beltway, they sense and they intuit that it should be higher than 55 mph, and they drive that," said John Townsend, spokesperson for AAA Mid-Atlantic. Townsend said the Capital Beltway was originally designed for 70 mph traffic. "What really moved the issue was the energy crisis back in 1973, and the governor decided to lower the speed limit to 55 to conserve energy, ironically, and it's remained at 55 since then," he said. Drivers have mixed reactions to the proposal for a 70 mph speed limit. "It's hard to have someone travel at that particular speed and maintain it. It's not practical to me," one man said. "From 55 to 70, I don't think that's a great idea, just because it's a lot of road rage already," a woman said. "Seventy miles is really not that fast," another woman said.